Athens, for those of us from the West, is where it all started. This is where a group of men got together for the first time in human history and decided that they would settle major choices with a citizen's vote, and thus democracy was born. A visit here helps you to understand how such a thing could have happened in a small city-state. 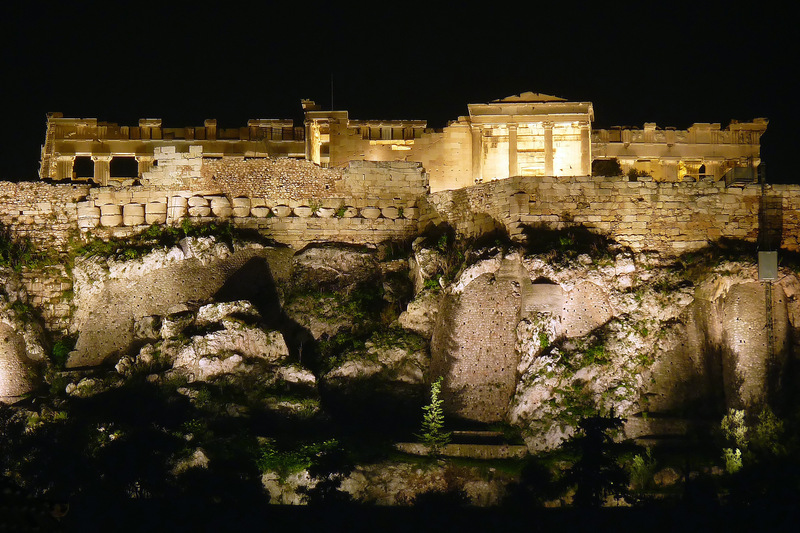 Athens is a place that sets fire to the imagination, as one wanders among the ancient monuments and visualizes what life might have been like during the Golden Age. The topography in the city center is the same as it was then, and the exceptional Mediterranean climate is the same. Then there are the ruins. A visitor from another planet would immediately conclude, on first inspection of the roughly 1km radius from the Acropolis, that a high order of human being indeed had lived here long ago. In years past, tourists flying into Athens would use it as a stopping off point for a more extended time spent on islands such as Mykonos or Santorini. The city was usually accorded a rushed, one-day quick-see while tourists waited for their boats to the islands. In this way they thought to avoid the overcrowded, hectic, sprawling, polluted thing that Athens had become since its population had exploded nearly ten-fold after the Second World War. Not anymore. Athens itself is becoming a destination, and a base for further flung day trips to places a bus ride away, such as Corinth, Delphi, Mycenae, and Epidaurus. Recent upgrades to the city's infrastructure have made the city center a much cleaner, much more accessible, and much more pedestrian friendly place. Several new metro lines are in place, providing quick and easy access to and from the airport, among other local destinaitons. Then there is the 5km Grand Promenade, the walkway linking the Acropolis and the brand-new Acropolis Museum, the Odeon of Herodes Atticus, Theatre of Dionysus Eleuthereus, Mars Hill, the Ancient Agora, the Pnyx, and the Kerameikos Cemetery. The Promenade is paved with gneiss cobblestones and marble slabs from the islands of Naxos and Tinos, and is surprisingly free of the intrusive sounds of this densely-populated city of over three million. All of which enables the visitor to project himself back in time. Let's start with the Acropolis, the focal point of Athens for its entire 6,000-plus years' history. There are three main structures on the Acropolis. If you think of the roughly oval-shaped rock as a clock face, as you face east toward the entrance of the rock, the three monuments would be the Propylaia directly in front of you at six o'clock, the Parthenon at three o'clock, and the Erechthion at nine o'clock. The Parthenon, perched on top of the Acropolis, itself an awe-inspiring upthrust of rock, catches the first-time visitor unaware. It is the greatest symbol of human freedom in the world. The Parthenon first impresses you with its massiveness, and its proportions are immensely pleasing to the eye. Artifacts from the Parthenon and the Acropolis have been collected in the sparkling new, ultra-modern Acropolis Museum, located just a short distance south of the Acropolis. 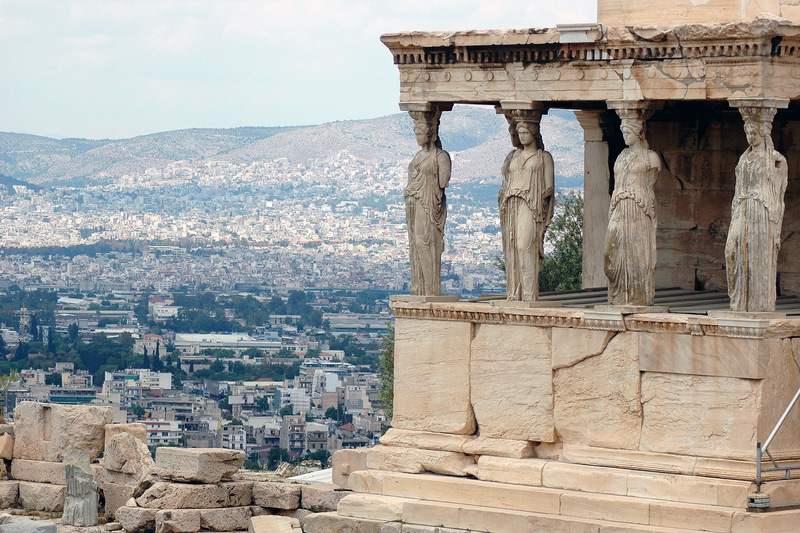 May and September are especially good months to see Athens. August is a good month, too, when nearly half the city empties out for Athenians taking their annual summer vacation. The absence of the pollution from their cars does wonders to the Athenian atmosphere, and one gets an idea of what a remarkable place this city was in antiquity, when the likes of Socrates, Pericles, and Euripides walked its streets. The air is light, and in the afternoon the Avra, the gentle sea breeze coming up from the port of Piraeus, fans visitors as they sit at any of many sidewalk cafes in the historical district of the Plaka, which huddles around the base of the Acropolis to its north and east. 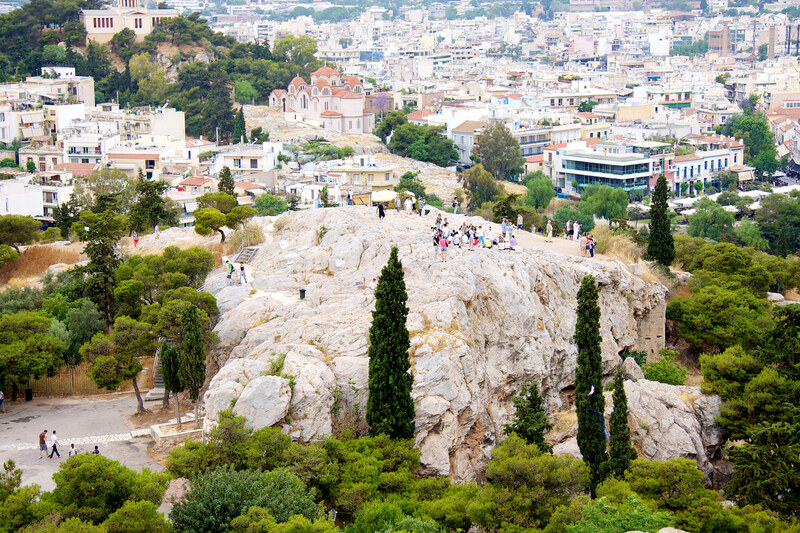 From the height of the Acropolis, one can see many of the other worthwhile sites in the city center. If you stand on the south parapet wall of the Acropolis, the first thing that strikes your eye is the huge, futuristic glass and concrete Acropolis Museum just 275m to the southeast. The museum has 3.4 acres (14,000 square meters) of floor space, housing over 4,000 objects, and a remarkable, spacious forecourt paved in thick plexiglass, which offers a clear view of the excavations of the ancient ruins uncovered during the building of the museum some 10m below its surface. A spectacular view of the Acropolis is offered through the glass walls of the museum from the its cafe and restaurant. Halfway between the Acropolis Museum and the Acropolis itself are the ruins of the Theater of Dionysus. This is where drama was born in 543 B.C., and where the plays of Sophocles, Aristophanes, and Euripides were first performed. The theatre once sat 17,000 people. Moving clockwise, about 94m southwest of the Acropolis, and to the right of the Theater of Dionysus about 275m is the 5,000-seat, restored Odeon of Herodes Atticus, built by the Romans in 161 AD. The Herodeon, as it is known, was completely restored in 1950 with marble seating, and is home for contemporary concerts, drama, and other performances during the yearly Athens Festival, which runs from the beginning of June until early August every year. Further to the southwest rises Philippappou Hill, or the Hill of the Muses, the traditional site of the cave where Socrates was imprisoned before his execution in 399 BC, and the Pnyx, the site of the ancient Athenian assembly, or ekklesia, where important matters of state were decided by democratic vote. The two-story marble structure on the highest point of the hill is a mausoleum/monument built in 116AD and honoring the memory of one Gaius Julius Antiochus Epiphanes Philopappos, an Athenian citizen and a prince of a kingdom in Asia Minor. Continuing clockwise from the viewpoint of the Acropolis,160m west and a little north is the bald outcrop of the Aereopagus (Mars Hill), 30m lower in elevations than the Acropolis. This is where the Apostle Paul spoke to an assembly of Athenian wise men during the summer of 51 AD. As soon as the Apostle mentioned the resurrection of the dead, the sophisticated elders laughed at him. But some believed, including Dionysus the Aeropagite, who founded a church under the north face of the outcrop. The foundations of the church are still there. A little further to the north and west of the Aereopagus are the extensive grounds of the Ancient Agora, with the reconstructed Stoa of Attalos, which houses the Agora Museum, and the Thisseon, the best-preserved ancient temple in Greece. 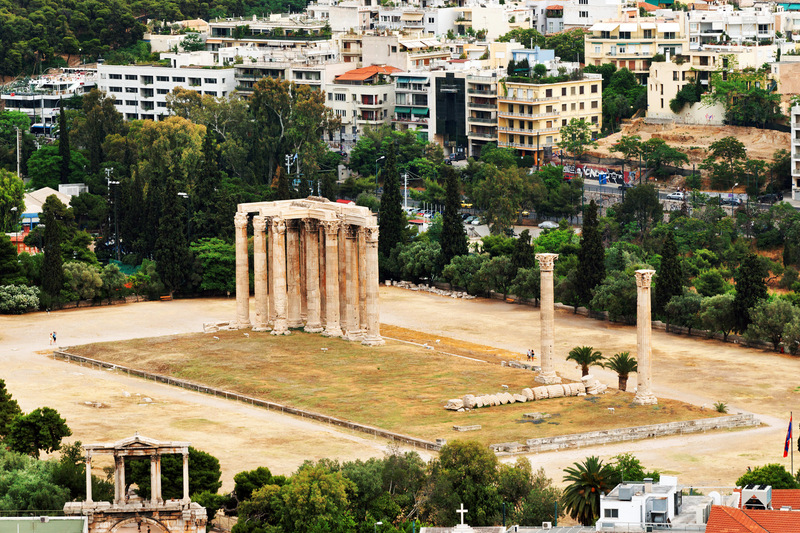 The Agora was a beehive of activity during the Golden Age, the beating heart of ancient Athens. Further still to the northwest, about 1km distant, are the grounds of the Kerameikos Cemetery, which had been unearthed during roadwork in the 1860's. Sculpted tombstones show moving private moments—a woman contemplating her jewelry box, a dog mourning its master. But it’s as much a celebration of life as death: there are toads and tortoises, many species of birds, and dozens of plant varieties. Just beyond (north of) the cemetery, across busy Pireos Avenue, is the Gazi district. The gas works for which this area was named are long gone, and its old buildings have been converted to a lively area of nightclubs and bars, and an alternative arts center. North of the Acropolis stretches, for miles and miles, the cement, multi-storied buildings of northern Greater Athens. Most buildings by law are no higher than six stories, so that the light of the sun shines at least part of the day on the streets dividing them. Closer in to the Acropolis, just to the right, or east, of the Ancient Agora, is the Roman Agora, with its famous Tower of the Winds, an octagonal marble structure that functioned as a horologion or "timepiece". It had sundials just below the friezes of the eight wind deities near the top of the tower, a water clock, and a wind vane. It was built sometime between 50-200 BC and, considering its height, 8m, and its prominent location within easy view of everyone in the Agora, was probably the world's first clock tower. Further afield to the north and east is Lycabbytos, at 300m Athens' highest point, shaped like a forested snow cone and topped by the church of St. George. Wolves were once thought to live there. This is the best spot to watch a sunset in Athens, as it looks down even on the Acropolis. 24 km behind Lycabbytos, in the same northeasterly direction, is the white gash in the side of Mt. Pendeli, where the marble for all of Athens’ monuments and buildings, including the Parthenon, was mined. Hugging the northeast base of the Acropolis are the cubic, whitewashed houses of the Anafiotika, a group of forty-five houses clinging to the steep base of the Acropolis and giving off a distinctive island vibe. These houses were built by men who came to Athens from the Cycladic islands to help rebuild the city after it regained its independence from the Turks in the 1820's. Anafiotika is an oasis of peace and quiet in Athens. The Plaka wraps around the base of the Acropolis to the north, northeast, and east. It's a quiet area bursting with tourist shops, galleries, and restaurants, and is jammed with tourists looking for souvenirs. Monistiraki, the "Little Monastery," divides the Plaka from the Monistiraki Flea Market, were antiques, old books, knickknacks of all kinds, prints, tools, and spare parts for almost any type of two-wheeled conveyance can be had for reasonable prices. Inside the Monastiraki metro station, recent excavations for a new metro line have uncovered the Eridanos river, a small stream flowing from antiquity from the slopes of Lycabbytos. A small museum can be found, showing the river, which was covered with a brick vault during Roman times, and the foundations of shops and houses backing up to it. These are just the highlights of a visit to Athens. There is so much more, including the National Archeological Museum, which houses the greatest collection of classical Greek antiquities in the world, Syntagma, or Constitution Square and the Vouli, or Parliament building, where one can watch the pom-pommed, pleated-skirt Evzones guard the Tomb of the Unknown Soldier, the Museum of Cycladic Art, the massive columns of the never finished Temple of the Olympian Zeus, The National Gardens, and the Byzantine Museum, just to name a few. And as far as Athens as a stopping place for the islands, how about using Athens as the base, since Aegina, the closest Greek island, is only an hour boat trip away and has all the charm and amenities of any other Greek island? 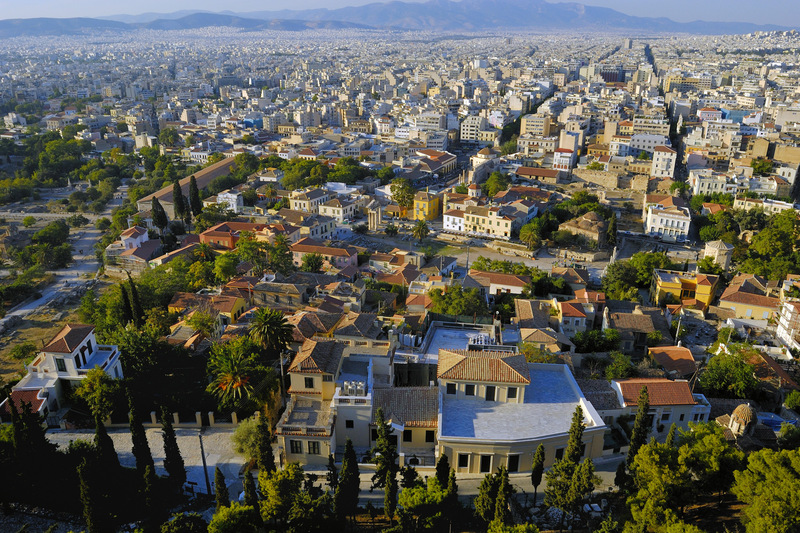 Athens is an unforgettably place for any visitor, and even more so now, with all of the recent improvements.